I actually saw a trailer for the film on YouTube and remembered thinking that I'd really like to see it when I noticed it said adapted from a book; after going onto google afterward I found a book which matched what gist of the plot I'd got from the film trailer. 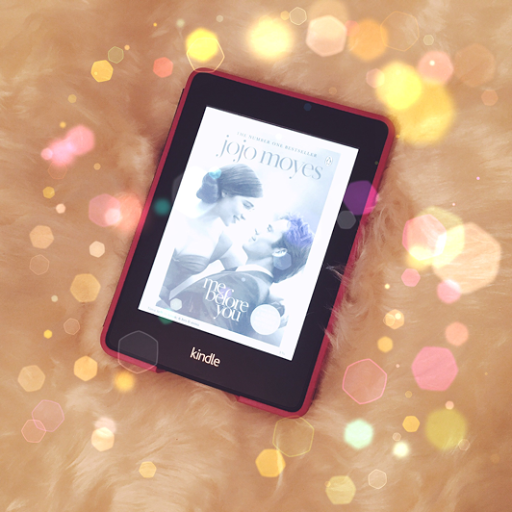 With no further ado, I paid and downloaded the book Me Before You onto my kindle paperwhite and began to read. Whenever a book has been adapted into a film, 90% of the time I do my best to read the novel first as films never live up to your own imagination. The one thing that I really got from this book is that the writer had a really compelling way of delving in and out of different characters and using them to provide an overview of situations from all angles which I really liked. The main character and overall voice of the book was somehow very simple but effective. What resonated with me was how she wasn't desperate to achieve anything, she was fairly content with her life; she just wanted to be able to provide for her family. It was nice to read a book where the main character wasn't made out to be this incredibly talented or beautiful being; instead she was a normal person who had flaws which was actually very refreshing. That said, she was definitely intelligent but she had never felt an impulses to improve her intelligence. At the start of the book, she was (in my opinion) a chatty, well meaning and carefree person. The book was fairly slow to begin with but as the chapters rolled onward it definitely picked up and became difficult to put down as the story expanded. She finds herself changing careers and accidentally changes her life completely during the process. Suddenly her life is put into perspective due to the arrival of a severely disabled person becoming the one person to open her mind to possibilities and the outside world. I got the impression that she's very sensitive and genuinely struggles with the path that her life has taken. If I'm honest I didn't want this book to end, the message throughout was exceedingly powerful; there were many funny moments but many more emotionally difficult moments where you genuinely wanted to cry alongside the various characters. For me this book wasn't the standard rom-com or chic-lit as the story didn't pan out at all as I expected and definitely was far more sad then first thought. I absolutely loved it and would read it again in a heartbeat, but the ending definitely didn't live up to my personal expectations; it seemed to end so suddenly and without much thought, which was a shame. I've now seen the film version and it was rubbish in comparison to the book but I still enjoyed it too. Both the book and the film forced me to feel as though I needed to be utterly and completely absorbed in the characters lives, particularly the main two but in reality I still can't explain the pull of seeing their relationship develop and ultimately come to an end. The book is an absolute rollercoaster but I definitely don't regret reading it and I actually have the sequel lined up to read in a week or so when I've recovered from this book. It takes a lot from the reader emotionally but that's what I think a novel should be able to do, to make you feel completely at one with what you're reading and want to know more. It's one to read if you want to read something well written, with plenty of substance that will make you think about taboo subjects.